We had previously learned that linear scattering can reduce the range of a death ray beam. Scattering has another trick up its sleeve, however - the scattered light can interact with the original laser light to make the original laser light scatter in the direction of the scattered light. In effect, this turns the air into another laser, powered by the original laser beam and amplifying the scattered light. Normally this effect is very weak. However, the rate at which it occurs is proportional to both the intensity of the original beam and the intensity of the scattered light. It you have a very intense original beam and a long path length over which the scattered light can be amplified, you can end up with a powerful intensity of scattered light that causes runaway stimulated scattering and the loss of most of your original beam. Unfortunately, for a death ray you want both a long range and a very intense beam, so stimulated scattering must be taken into account. In air, the most significant form of stimulated scattering is stimulated Raman scattering. In Raman scattering, one photon (an irreducable unit of vibration of light) is absorbed and two lower energy photons of light are produced which sum to the original photon's energy. Because energy of a photon is inversely proportional to its wavelength, this gives the scattered photons (and thus the scattered light) a longer wavelength. In stimulated Raman scattering (often abbreviated SRS), one of the two scattered waves will amplify the scattering of the original wave into the same scattered waves. Of all the SRS processes that happen in air, the strongest is Raman scattering off of nitrogen. Since this is the strongest, it will amplify the fastest and prevent other forms of stimulated scattering from having any significant effect. It is found that the amount of SRS off nitrogen does not depend on the amount of nitrogen when the partial pressure (the pressure of the gas when all other kinds of gas are neglected) is more than about 1.3×10-3 atmospheres (130 Pa in SI units). When there is less nitrogen than this, the amount of scattering decreases with partial pressure. For any atmosphere breathable by humans, however, the SRS will be unchanges and dominated by nitrogen unless a lot of effort has been taken to remove the nitrogen from the air. If the light starts out with a wavelength of λ, the Raman scattering from nitrogen produces light with a wavelength of λs1 = 0.0076 m and light with a wavelength of λs2 = 1/(1/λ - 1/λs1). For any reasonable starting wavelength, the scattered light in λs2 will contain almost all of the scattered energy. The image below illustrates how SRS will degrade beam quality. Since only scattered light that travels a long distance through the beam is amplified significantly, one might think that the scattering would not be much of a problem, since it is already going in the beam direction so all the energy ends up at the target anyway. So consider the case below, where a beam (green) is shining through the air from left to right. A molecule near the start of the beam but also on the beam edge emits scattered light (red). One path does not go far enough through the beam to be significantly amplified, and leaves the beam without carrying away much power. The other path shown travels diagonal through the beam for long enough to undergo significant amplification, and leaves at an angle to the beam. This light carries away enough power from the beam to cause problems. 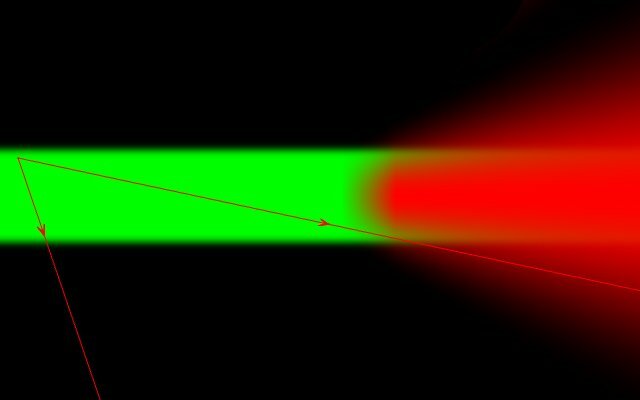 All the other light paths from molecules near the beginning of the beam that go through sufficient lengths of the beam are also amplified, so you get a fan of scattered radiation (red) once the distance gets large enough, and the beam can no longer maintain its focus. The image is not to scale, and typically the fan of scattered radiation will be much narrower, but in general once runaway SRS starts you will be unable to focus your beam any tighter. What can you do to avoid runaway SRS ruining your beam before it is focused? You can try to keep the intensity low over as much of the beam as possible. Again, this means having a beam that is large at the aperture but focuses down to a smaller spot at the larget. Use longer wavelengths. The SRS off nitrogen generally decreases with increasing wavelength. This means you have a trade-off between short wavelengths giving low diffraction but high SRS. Use a beam of linearly polarized light. Linear polarization is amplified not quite as fast as circularly polarized light. Since there is no real advantage for a death ray to use circularly or elliptically polarized light, it will be assumed henceforth that the death ray is emitting light with only linear polarization. Pre-empt the scattered beam. The scattered light with wavelength λs2 is almost the same wavelength as the original beam and contains almost all the energy of the original beam. If you emit a weak beam with wavelength λs2 that is still stronger than the spontaneous Raman scattered light and which is focused in the same place, this beam will be amplified and use up the power of the original beam before the spontaneously scattered light can cause enough SRS to matter. This new beam will have almost all the energy as the original beam and will be focused almost as tightly. Of course, eventually the new beam will also cause runaway SRS, so if the increased range is still not enough you can add a third beam of at the scattered wavelength of the second beam, and a fourth beam at the scattered wavelength of the third beam, and so on. These additional wavelengths in the beam are called Raman modes. Keep the intensity so high that the beam self-focuses before SRS becomes a problem. You still get runaway SRS (along with lots of other non-linear processes), but the scattered light is trapped in the self focused filament so it does not matter. Eliminate the nitrogen molecules. This is the method used by ray beams, which strongly ionize the air. With all their electrons gone, nitrogen atoms can't form chemical bonds to make molecules. Most ray beams also use the beam-channel plasma to create a partial vacuum for the beam to go through. Before getting to the technical details of how to estimate SRS, here is a calculator for determining the range or minimum spot size for input beam parameters. where g is a parameter describing how easily the scattered light is amplified called the gain, I is the intensity of the beam, and z is the distance traveled by the beam. (4 g P/(π D2)) [z/(1-z/zf)] = 25.
z = 1/((4 g P)/(25 π D2) + (1-S/D)/z0). To avoid runaway scattering at desired spot, we need z ≥ z0. z0 ≤ 25 π S D / (4 g P). where λr = 1.12×10-7 m.
where τ ≈ 5×10-9 s. A consequence of this is that for pulses less than about a nanosecond the SRS is essentially independent of the power and is constant for a given energy, while for beam durations longer than a few tens of nanoseconds the opposite is true.